Salon pricing — more specifically nail services pricing — has been an issue for as long as I have been in the industry. 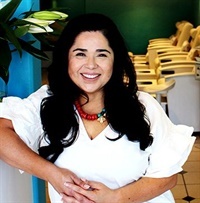 I have heard every reason there is not to charge enough to make a good living — from my “clients are my friends” to” they would all leave me if I charged more.” Recently I was introduced to salon owner Claudia Cordova Papa, who had a powerful story along with a passion to help the entire industry find elevation. I asked Claudia to share her experience so that some of you may find yourselves, some of you may find hope, and some of you may just find a way to love your career again, since it would no longer be draining you if you charged enough to make a good living instead of competing with discount salons or even fighting your own mental struggles about your worth. Whenever I meet manicurists and other nail salon owners, the discussion about setting prices for nail care services is always a difficult one. The conversations are usually the same no matter what sector of the nail world my colleagues are in and they eventually lead to nail care sisters sharing advice on how to compete against the discount salons in their area. Pricing skin and nail care services is surprisingly like doing nails. Both require a combination of creativity, curiosity, and math. You need professional experience, ongoing education, and a heavy dose of creativity to come up with a mix that is totally unique and, as such, cannot be compared to other local businesses. The most important lesson I have learned is that you should never price according to your neighbors. The reason being is that it’s not always possible to determine what motivates a competitor’s pricing, and often profit — the lifeblood of any business — is not always included in pricing calculations. In the fruit basket of comparison, the range of pricing of local services is not apples to apples, but rather apples to oranges. As soon as you understand that truth, you are free to move on to the fun of owning a business and release any of the fear, shame, or judgement that is often attached to pricing. The most important lesson I have learned is that you should never price according to your neighbors. Over time, I’ve accepted advice from well-meaning peers, resulting in the growth of my business to a $1 million+ annual revenue in a 1,200 square foot space and providing our manicurists with the opportunities they were seeking. Many of the manicurists who worked for my company back then were able to purchase their own homes in an area where the median home price is $900,000, finish college, and, for some, start their own businesses. The role I played in these accomplishments is something I should have been proud of. However, the reality was that my company was making less than 5% profit when healthy companies in our industry make 12%-14%; I was frequently not paying myself an owner’s salary; and, worse, I was tapping into my hard-earned retirement savings to get through the winter seasons. All this while working 10 or more hours a day, seven days a week. It was not a great place to be. What I was doing wrong was focusing on competing with the discount salons. I was trying to serve as many clients as possible at prices that were a little higher than the seven discount nail salons located within a two-mile radius of may salon, Aqua. However, Aqua is beautiful, clean, and we employ service providers who are dedicated to communicating and connecting with clients. We are health conscious, use organic products, and strictly follow state board rules. All of this and our prices were within $3 to $5 of those of the discount nail salons in my area. Even more amazing is that our prices stayed the same for seven years because I was so afraid of losing clients due to a price increase. It was a miracle that we didn’t go bankrupt. After 10 years of working like this, I was overwhelmed and stressed. Our work environment had become a soulless place where the quantity of work was our single focus. It is no wonder that employees staged a walkout. Shortly after the walkout, Aqua experienced a major water leak that damaged our pedicure area and required a costly repair. And if all that wasn’t enough, California changed their labor laws and to be compliant to state labor code changes I would need to reclassify all our independent contractors as employees. I knew that running a company with employees would require a different skill set that I did not possess. Read part of this blog post here.